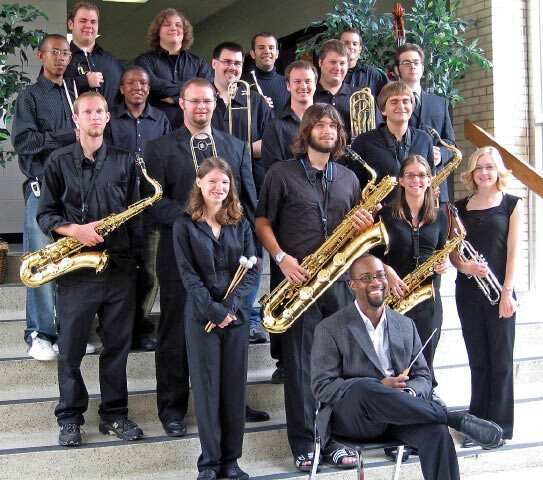 September 28, 2006 - The Department of Music at Arkansas State University in Jonesboro will present the Jazz Lab Band and ASU Tribe in concert on Thursday, Oct. 12, at 7:30 p.m. in Fowler Center, Riceland Hall. 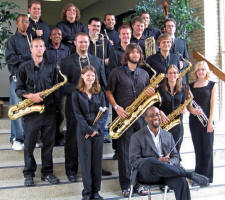 The ASU Jazz Bands are under the direction of new ASU faculty member, E. Ron Horton. This concert promises to have music for jazz fans of all tastes as the band performs big band music from a variety of eras and in a multitude of styles. The concert will open with two tunes performed by the ASU Jazz Lab Band. The first is Dizzy Gillespie’s Manteca. This is a Latin jazz favorite that is full of energy from the first note to the last. The Lab Band will also perform a song written and arranged by Thad Jones, A Child is Born. This beautiful ballad will feature pianist Willie Sullivan, trumpeter Will Hartzel, and the Lab Band saxophone section, lead by Allen Adcock. Among the pieces that will be performed by the Tribe is Royal Garden Blues. This song was first performed by “King” Joe Oliver, who worked regularly at the Royal Garden Club in Chicago in the late 1910s. This arrangement captures the essence of the original and will showcase the band’s strength as an ensemble. The Tribe will also play John Coltrane’s Naima. This version is arranged as a bossa nova and will feature Michael Newson on the soprano saxophone. Adding to the Tribe will be vocalist Ashley McBryde, who will be featured in a new treatment of the classic jazz standard Misty and will sing the sultry ballad Angel Eyes with the ASU Jazz Trio. The closer for the evening will be a straight ahead modern arrangement of Miles Davis’ Milestones by Mike Tomaro. This piece is exciting from beginning to end, and will feature solos by Grant W. Harbison on trumpet and Daniel Rickman on tenor saxophone. Members of the ASU Jazz Lab Band are Allen Adcock of Jonesboro, Ashley Flory of Cherokee Village, alto saxophone; Lauren Smith and Barry Goode, both of Jonesboro, tenor saxophone; Nichole Burdyshaw of Bono, baritone saxophone; Treavor Mitchell, Kade Holliday, Jeremy Ramsey all of Jonesboro, trombone; Antonio Starks and Angela Guajardo, both of Jonesboro, Will Hartzel of Forrest City, Kevin Baugh of Gosnell, trumpet; Willie Sullivan of Jonesboro, piano; Douglas Turner and Tonia Spurlock, both of Highland, bass; Perry Harper of Paragould, Jason Wagner of Jonesboro, drums; Jay Burns of Jonesboro, guitar. Members of the ASU Tribe are Claire Richardson of Jonesboro and Michael Newson of Memphis, alto saxophone; Daniel Rickman and Allen Adcock, both of Jonesboro, tenor saxophone; Adam Leslie of Jonesboro, baritone saxophone; Corey Emerson of Poplar Bluff, Mo., Blake Howerton of Paragould, Matt Strawbridge of Jonesboro, trombone; Corey Spencer of Wynne, bass trombone; Luke Walker and Sara DeClerk, both of Pocahontas, Joseph Curtis of Trumann, Grant W. Harbison of Jonesboro, trumpet; Janet Rooney of Trumann, piano and vibes; Maricio Dixon of Wynne, piano; Kevin Cremeens of Jonesboro, bass; Curtis Farley of Jonesboro, Jamel Alford of East St. Louis, Ill., drums.